Chinese President Xi Jinping met his Russian counterpart Vladimir Putin in Ufa, Russia on Wednesday ahead of the BRICS and Shanghai Cooperation Organization (SCO) summits, additional forums for China to showcase its adeptness at developing multi-level and multilateral diplomacy, experts said. The dual conferences, from Wednesday to Friday, provide China with a platform to discuss issues that matter to China with several countries simultaneously, Wang Yiwei, director of the Institute of International Affairs at the Renmin University of China, told the Global Times. 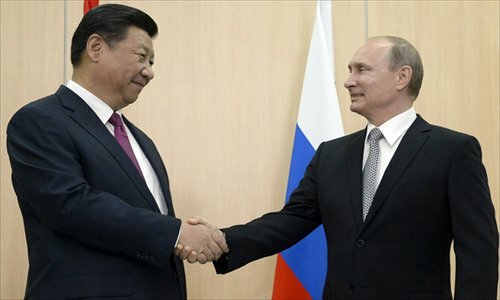 Xi said China and Russia should jointly direct relevant mechanisms to deepen cooperation, take effective measures in tackling such challenges as terrorism and drug trafficking and maintain regional security, so as to enable the SCO to play a bigger role in safeguarding the common interests of all countries in the region, according to the Xinhua News Agency. Xi suggested the two sides take the SCO as an important platform to dovetail China's Silk Road Economic Belt initiative with Russia's aspiration under the Eurasian Economic Union framework. Xi also met with Indian Prime Minister Narendra Modi in the southwestern Russian city of Ufa late Wednesday. At the two-day BRICS Summit starting Wednesday, the BRICS group is expected to launch the New Development Bank and finalize a $100 billion emergency reserve arrangement. The group will also draft a blueprint for their trade and economic collaboration in the next few years by passing a "BRICS Economic Partnership Strategy." The institution's board of governors held its first meeting in Moscow on Tuesday to appoint members of the board of directors and management, and discussed the bank's five-year plan. The BRICS group of emerging economies - Brazil, Russia, India, China and South Africa - is expected to deepen consensus on major initiatives such as the "One Belt, One Road" initiative and the Asian Infrastructure Investment Bank (AIIB), Chinese Vice Foreign Minister Cheng Guoping said Monday. "According to China's current proactive diplomatic strategy, China seeks every opportunity to propose new issues," Jin Canrong, vice director of the School of International Studies at the Renmin University of China, told the Global Times. Meanwhile, the BRICS group will hold talks with the six SCO member states - China, Russia, Kazakhstan, Tajikistan, Kyrgyzstan and Uzbekistan - and SCO observers Afghanistan, India, Iran, Mongolia and Pakistan, as well as the Eurasia Economic Union. As the SCO members, which focus on security cooperation, sit along the new Silk Road proposed by Chinese President Xi, China can present its renewed concept of national security to other countries during their talks in a bid to extend security cooperation, Wang said. It is necessary for the SCO to widen its spectrum to areas like cyber security, instead of limiting its joint security efforts to terrorism, separatism and extremism, he said. In addition to diplomacy, experts believe that such multi-channel cooperation can consolidate relations within the BRICS and SCO groups. In order to ensure the BRICS members can provide US dollars to each other in case of liquidity problems, the five central banks agreed to invest in the BRICS pool of currency reserves on Tuesday, Reuters reported. Of the $100 billion in reserves, China will contribute $41 billion. Brazil, India and Russia will contribute $18 billion each and South Africa will contribute $5 billion. "With multi-channel cooperation such as the BRICS New Development Bank and the AIIB, the BRICS nations will be closely tied to each other," Wang Youming, a research fellow of the BRICS Economic Think Tank of Tsinghua University, told the Global Times. The China-initiated AIIB has 57 founding members, including Russia, India, Brazil and South Africa. "Economic cooperation within the BRICS group is far from enough, given the small trade volume," Wang Youming said. The trade volume of the five countries accounts for 16 percent of global trade, while trade within the group was only $336 billion, which is 1.5 percent of global trade, Li Hui, Chinese Ambassador to Russia, was quoted by Beijing-based Economic Daily's website ce.cn on Tuesday. Dismissing statements that it is unnecessary to set up two banks whose functions overlap, Wang Youming said "the more sources of capital the countries can depend on, the better they can withstand financial crises." "I think there is enough room for everybody. Our economy lacks investments … So, the Asian bank, BRICS and other banks will have room for investments," Russian Minister of Economic Development Aleksey Ulyukayev told RT on Tuesday. Besides, China and Russia also need to strengthen cooperation through multilateral platforms, since the current bilateral collaboration which concentrates on energy is "weak," although both countries have repeatedly committed to enhance their partnership, Wang Yiwei added.